Having led car lift innovation for more than 28 years, Challenger™ is no stranger to the necessity of convenience. Save on space while minimizing fatigue by investing in a quality four-post lift made by one of the best brands in the automotive business. We offer an extensive selection of Challenger™ heavy-duty four-post lifts that can handle a wide variety of vehicles weighing between 12,000 and 40,000 pounds. Best of all, we offer interest-free financing for up to six months on select products. You can apply for equipment financing today with no obligation. Explore our selection of Challenger™ heavy-duty four-post car lifts to find the perfect solution for your service bay. Heavy-duty mobile lifting systems offer the very most flexibility. 14,000 lbs. capacity (per column) Mobile column lift - Battery powered, wireless, adjustable carriage assembly accommodates wheel diameters from 5 in. to 24.5 in. (set of 4). Height of Lift Unit: 88.5"
Height of Lift Unit at Full Rise: 157.125"
Max Lifting Height (2 Columns): 32"
Heavy-duty mobile lifting systems offer the very most flexibility. 19,000 lbs. capacity (per column) Mobile column lift - Battery powered, wireless, adjustable carriage assembly accommodates wheel diameters from 5 in. to 24.5 in. (set of 2). Heavy-duty mobile lifting systems offer the very most flexibility. 19,000 lbs. capacity (per column) Mobile column lift - Battery powered, wireless, adjustable carriage assembly accommodates wheel diameters from 5 in. to 24.5 in. (set of 4). Max Lifting Height (4 or more): 69"
Unlike two-post lifts, four-post lifts offer the versatility to handle varying wheelbases and accommodate different weight distributions easily. With one of our Challenger™ heavy-duty four-post lifts, you and your technicians can maximize profit potential by extending your service offering to include oil changes, tire changes, wheel alignment services, and so much more. Our 12,000-pound models are the best choices for two-person oil change operations. These four-post lube lifts allow one person to check fluids under the hood while another changes filters or fluids underneath. 14,000-pound lifts are available in standard or extended lengths and come with louvered approach ramps, automatic wheel stops, and the highest rise in the industry. Challenger’s 4015-Series includes complete packages for expanding your service offering and revenue potential. Between flat deck lifts and alignment rack packages, this series offers the versatility your business needs to serve customers efficiently and safely. Flat deck lifts are great for general services, whereas alignment rack packages are excellent for truck repair. 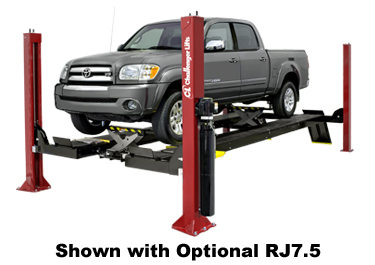 Unlike flat deck vehicle lifts, alignment rack car lifts allow shops to perform two-wheel alignment services from 166.5 to 194 inches and four-wheel alignment services from 88 to 158 inches. If you routinely service medium- or heavy-duty vehicles, we have just the solution for you. Challenger™ heavy-duty four-post car lifts are capable of lifting between 18,000 and 40,000 pounds, and most models include high tensile strength lift chains, sealed roller bearings for maximum reliability, and other beneficial features. Shop from our selection today to take advantage of our free shipping offer while supplies last. If you have any questions about our product selection or need help, please contact Best Buy Auto Equipment today for information or further assistance.